What is a "dual coil" glow plug? Dual Coil Glow plugs, as their name implies, have two heating elements instead of just one. The addition of an extra coil allows the glow plug to have a "self-regulating" feature. In the past, glow plug design was a balancing act. If resistance was low, the plug would get very hot quickly, but would burn out. If resistance was high, the glow plug would heat up slowly, and not get very hot, but last virtually forever. Dual coil designs have what is called a "positive temperature coefficient" – the hotter the glow plug gets, the higher its resistance goes. This allows the glow plug to get very hot quickly for faster starts, but gives extended life at the same time. Does it make a difference which glow plugs I buy? Yes, there are places to save money - cheap fuzzy dice to hang from your rearview mirror come to mind. Spend a little more and get QUALITY glow plugs. No-name white box glow plugs, or some cheaper aftermarket glow plugs are likely to swell, making removal impossible, or worse, the tip can swell and break off in the cylinder, causing piston, cylinder, valve, and head damage and requiring a costly engine rebuild. Our supplier is the only company we are aware of making all of there glow plugs 100% right here in the USA and is also the sole source supplier of US Military HUMVEE glow plugs. Do it once, do it right with a set of our quality glow plugs! What are some symptoms of bad glow plugs? In a nutshell, slow starting, and complete failure to start. Once the vehicle does start, missing, rough idle, hesitation, and lots of white smoke until the engine warms. If you have a four cylinder, one glow plug bad will cause slight hard starting and a miss. Two will cause a very hard start and very rough operation. Three bad plugs makes the vehicle almost impossible to start and keep running. The same applies to larger engines. If your vehicle starts OK if you plug in the block heater overnight, but will not start if you do not, then you probably have a glowplug issue unless your engine has very low compression. How do I check my glow plugs? Easy – Anyone can do it! First, disconnect the wires from each of your glow plugs. Then, hook the clip of your 12 volt test light to the battery POSITIVE terminal. Touch the probe of your test light to the terminal of the glow plug itself (NOT the wiring harness!). Any glow plugs that does not light the test light is bad. Alternate methods – Use an ohmmeter – (Again, disconnect all wires from each glow plug to prevent parallel paths.) Measure resistance between ground the terminal of each glow plug. Any glow plug that indicates infinity or more than a few ohms is bad. Use an ammeter – measure the current draw of each plug individually – using this method, you can catch glow plugs with slightly low current draw that are starting to fail. What makes glow plugs fail? r engine probably has injectors that drip on the glow plugs causing them to be erode. Sometimes the vehicles glow plug controller will "stick on" causing very quick failure of the glow plugs. Often times the light on the dash will not come on to alert you that this is happening. The Ford/International 6.9L diesel is famous for this – it is advisable to consider replacement of the controller on this engine when replacing glow plugs. Another common cause is the use of high-amperage battery chargers to "boost" start an engine. Many of these chargers put out too high of a voltage and will actually explode the tip of the glow plug – anything that causes a voltage spike in your vehicle's electrical systems may harm the plugs. If your glow plugs all fail at the same time, they did not die naturally – they were killed! Can I replace my own glow plugs? Sure! If you can change spark plugs, glow plugs should be no sweat! Disconnect the wire, thread out the old plug, and thread the new one in! A little anti-sieze compound on the threads is a good idea. Be careful not to break the plug off. Remember, they are hollow like a spark plug – don't over-torque them – just snug them up. You can buy online factory service info for your vehicle at www.Alldatadiy.com if you need step-by step details. I have a 7.3L Powerstroke – Where are my glow plugs? They are under the valve covers! Once you have the valve covers off they are a piece of cake! Don't forget that sometimes the short wiring harness that connects to the glow plugs and injectors under the valve covers goes bad and does not supply the glow plugs with power. 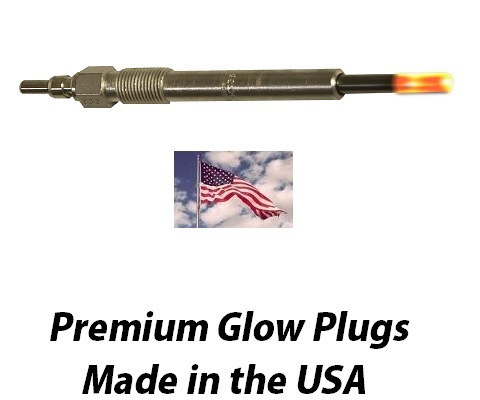 These are easily replaced and available on our website - our premium 7.3 Powerstroke glow plugs. Failure of the glow plug relay is extremely common on the Powerstroke – instructions for checking it here. What if my glow plug light does not come on at all? First, check your fuses! After that, some electrical checks may be in order, but keep the glow plug controller at the top of your suspect list. These handle a lot of current, so are destined to fail. Consider our glow plug kits with new glow plugs and controller. My glow plug light stays on for the wrong time period!Some glow plug controllers sense glow plug resistance. If one or more plugs have failed, the controller will not function correctly. You may need to replace the glow plugs and then re-check the time interval which will vary with temperature. In other cases, glow plug controller or temperature sensor replacement may be necessary. What if some of my glow plugs are stuck in the engine? Occasionally, the tips of early design glow plugs as well as more recent inferior designs will tend to swell up as the glow plug fails. This can make the glow plug very difficult to remove. The glow plug will thread out but will not come any further. OTC makes a special glow plug puller tool. Here is how to make your own substitute. Thread the glow plug out as far as it will go. Then, find a nut with threads that match those of the glow plug. Cut the nut in half and re-assemble it over the glow plug threads using a hose clamp to hold the halves of the nut together. Now use a wrench to keep threading out the glow plug aided by the additional threads. This method usually provides sufficient leverage to pull out the stuck plug.